Here's one that is being discusses over in the Destruction Forum: How do the Ardboyz Shields work exactly? Specifically, at what point in the wounding/damage process are the saves taken? - Do the Shields save against Wounds before Damage is calculated? Like for d3 or multi-damage weapons? - And do the Shields work against Mortal Wounds? Some of us are in each camp on both questions, that we all know it does something. If GW could give us an official ruling via the FAQs, that would be greatly appreciated. Is the Grot Warboss's Gobba treated as a mount? Or another weapon? Do the mounts-rule also apply to normal units? For instance can the weapon "Cold One’s Vicious Bite" get +1 in a Saurus Knights unit? 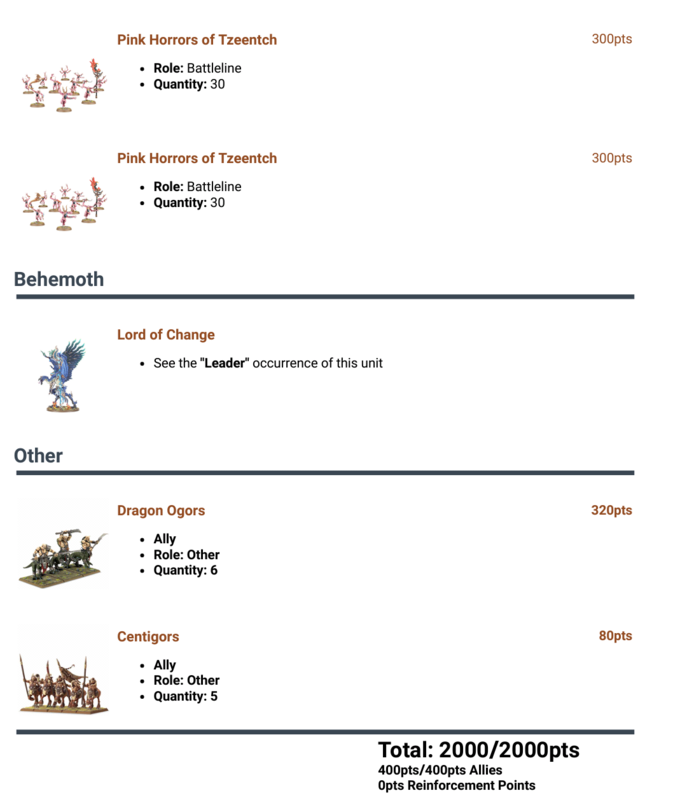 Russ Veal on @FaceHammer just said that mounts rule is Command TRAITS and Artefacts - seems clear. Or is the example from the Azyr app above incorrect? A player can spend some of their points on allied units. The Pitched Battle profile for each faction lists the allegiances of the allied units you can take. Allied units can have a different allegiance to the rest of the army." How does engine of the gods work with matched play? I.e. On scenarios where you score at the end of your turn. If you make an 18+ on the engine of gods roll chart, do you score in that extra free turn as well? Also, do your buffs that last until the next hero phase mean the next battle rounds hero phase or imply that you will indeed have to rebuff in the proceeding (free) turn phase? I.e prayers or mystic shields ect. Clan Pestilens echoes of great plagues trait talks about prayers cast by pestilent priest. If verminlord corruptor has gained access to prayers through command trait or artifact, is he for all intents and purposes counted as being "pestilent priest"? Command trait and the artifact do not state whether verminlord receives priest keyword or not. The Start Collecting:Malignant box is currently not playable as on the box for Pitched Battle. Nighthaunt do not have Deathmages as an ally, this means that they are unable to run the Spirit Host/Hex Wraith and Mortis Engine as an initial basic army. I'd love to know what the design team intended with the Factions and Allies, as Ive browsed the GH2017 a couple of times now and nowhere does it actually say that you have to thake units from a particular Faction. Nor does it say you have to have matching Keywords for an army. All it says to me is that in order to apply for "two" different Allegiances you can only spend up to X ammount of points for your army. 1. Have Factions be the new variant on Grand Allegiance army builds (as per previous Generals Handbook). Thus be restrictive but gain the advantage of double Allegiance options. 2. Have the Factions and Allies only act as a list so you can apply for two different Allegiances per army. Thus you can still create armies like GH2016's Grand Allegiances suggest. 3. Have the Factions be an exclusive way to build armies. Better put, if you play Blades of Khorne you must spend at least 1600 points of a 2000 point Blades of Khorne Army. 1. I would like to know if it's intentional that Daemons of Nurgle does not have the Nurgle Rotbringers as an Ally. 2. I would like to know if it's intentional that Nurgle Rotbringers does not have the Daemons of Nurgle or Clan Pestilens as an Ally. 1. 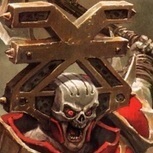 Is it intentional that only Everchosen can make use of this Faction as an Ally? I ask this because the Faction itself does not have acces to any Battleline options and only Everchosen has acces to this Faction as an Ally. 1. Is it intentional that only Stormcast can ally with the Aelf? 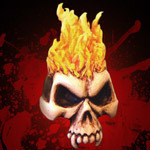 As all other Factions have no acces to them and like Daemons of Chaos they cannot become a legal army by themselves? 1. Can we now use the full extend of Allegiance abilities for the Allied troops? The GH2017 seems to suggest as such. Does this for example mean that 400 points of Tzeentch Allegiance Desciples of Tzeentch Allies has acces to the Fate Dice? Is the coven throne regarded as a mount? If so which attacks are considered to be affected by command traits? The vampire and hand maidens or just the vampire? And this isn't a ghb question but the zombie shambling horde rule. How does the rule 'merge' work? If there are conditions applied to one unit which merged with the other do they now both apply to the merged unit? If these are contradictory how do I determine which apply? Is a new unit created when the units merge? If so, is the new units merged size considered the starting size for that unit in matched play? Q:// Dracothian's Tail page 133, It states that you can summon units included in the battalion using a summoning spell. Is this summoning spell restricted to the number of models mentioned in the augmented spell description. Example: can I summon a 40 unit saurus unit or would I be restricted to the maximum unit size described in the spell 20 saurus models. Expected answer: yes, you can exceed the unit size described in the spell. you can summon a units up to the unit max size described in the match play profiles. Q:// can warpstone shards be used to double mortal wound damage output such as warpfire throwers, warfare protectors, spell castings etc...? So you choose to allocate the first wound to an Ardboy with an Orruk-forged Shield. Roll for the shield: it's a 4, so the wound isn't ignored and gets allocated to him. The next wound also has to be allocated to the already wounded model, so you would again roll for the shield. Let's say it's a 6, so the wound is ignored. Allocate the next wound to the same model, the roll is a 2 and he takes the wound. This was his last wound, so he is slain. The ability only specifies when "wounds" are allocated, so it wouldn't have any affect on mortal wounds. I thought it would be a good initiative to collate the community's rules questions regarding the General's Handbook 2017, the accompanying FAQs, and Forgeworld and Compendium warscrolls. I do this partly from self-interest in that I am running a tournament in mid-September and want to flush out any issues before the tournament.  I don't want this thread to be a home for complaints, negativity, or subjective commentary on the value or wisdom of particular rulings. Rather, a collection of neutral questions seeking clarity regarding particular rules wordings, potential new FAQs, and even typos. In short, be constructive. Hopefully this will be a valuable resource for the community. Daemon Prince is included in the Slaves to Darkness Pitched Battle profile, but does not have the Slaves to Darkness keyword. 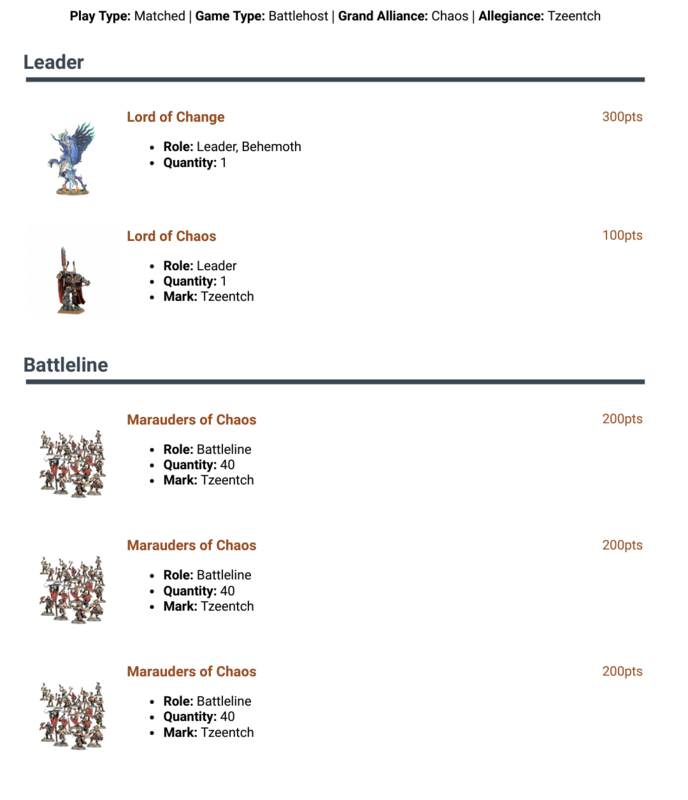 Does this lack of keyword in any way limit or impact the selection of Daemon Princes, or their roles regarding Command Traits or Artefacts, within a Slaves to Darkness army? 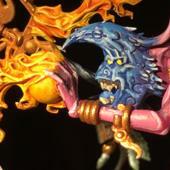 Q: Exalted Greater Daemons are not named characters, so do they have access to traits and Artefacts? Hoping this will be the answer. They are pointed as if they can be customised. Does the Weird-nob count as the "closest Orruk Unit" for the purposes of suffering Mortal Wounds on a casting roll of a double? When do the suffered Mortal Wounds on a double come into play? Is it any time that the Weird-nob casts, or just when there are 20+ Orruk models nearby? Or does it kick in at 10+ nearby Orruk models? Hello guys, I have a question that I thought was FAQed but apparently it hasn't about the Bloodclaw's Batallion "Saurus Scar Veteran". Q: For the Glean Magic spell of the Curseling, you roll 2D6 and have to roll "equal to or greater than" the casting value of the spell being learned, which corresponds to how a casting roll is described. Does this 2D6 roll count as a casting roll? Question, is the Guardians of the Dawnspire a valid battalion in matched play under GHB2017? It has pitched battle points. Both of the Skaven allegiances are named "SKAVEN PESTILENS" and "SKAVEN SKRYRE." That would mean that the unit would have to have the keywords for SKAVEN and for PESTILENS or SKRYRE, right? Since the Verminlords don't have the SKAVEN keyword, that means they can't be part of that Allegiance. The Corrupror, for example, only has "PESTILENS," not "SKAVEN PESTILENS." So, is it correct that the only way a Verminlord Corruptor can be in a SKAVEN PESTILENS Allegiance is if it was included as part of the "Virulent Procession" Warscroll Battalion, since the battalion has the SKAVEN PESTILENS keyword, and grants it to its units?